Santiago Airport (SCL) handles over six million passengers with direct flights to numerous South American and international destinations, including leading European cities. Located 11 miles (17 kilometers) northwest of Santiago, Chile, in the suburb of Pudahuel, Arturo Merino BenÃ­tez International Airport is served by official, "blue" taxis and buses, with car hire firms presenting several transport options into the city. Ample parking is also available, with a shuttle service linking long-term parking and the terminal. Aeroporto de Santiago has extensive passenger amenities at its two terminals, including four duty-free shopping areas, currency, ATMs, banks and business services; call centers, information desks, special needs, medical, and family facilities. SCL has a choice of bars, restaurants and fast food vendors. Chile's flag carrier LanChile is the principal airline connecting passengers to other South American countries. 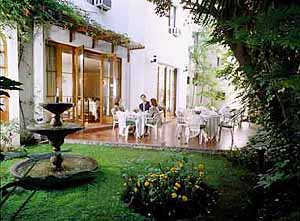 Santiago de Chile World Airport Guide provides you with access to a complete selection of Santiago de Chile airport hotels. Utilize the discounts offered directly from the hotel, with the assurance of secure booking. Extra services include airport car rental, airport car parking and flights to and from Santiago de Chile Airport. Please note: The term Aeropuerto de Santiago SCL as well as all associated graphics, logos, and/or other trademarks, tradenames or copyrights are the property of the Santiago Airport authority and are used herein for factual descriptive purposes only. We are in no way associated with or authorized by the Santiago Airport authority and neither that entity nor any of its affiliates have licensed or endorsed us.